Classic Wiring Harness Complete Update. A replacement headlight switch with internal 25-amp circuit breaker, adjustable length shaft, and custom knob. Standard turn signal flasher, hazard flasher, and horn relay mounted on harness. Fuse box designed to fit in original location with no mods to the firewall. All required hardware supplied. New ATO fuse panel allows for easy fuse and circuit breaker accessibility. Harness is laid out and formed to allow for nearly all after market accessories such as; gauge packages, wiper systems, heat and air conditioning systems, etc. Many original switch connector bodies – an American Autowire exclusive feature. Steering column connectors can plug directly into most aftermarket steering columns or stock 1973-79 Ford columns using the adapter and terminals included in the kit. Separate under dash courtesy lamp assemblies are also included for use along with your original dome/interior lighting feeds. Instrument Cluster wiring is designed with a “cluster harness disconnect” system for easy service and assembly. Original terminals that will plug into the original cluster connector (another American Autowire exclusive) are provided for stock cluster connections. The system will also connect into most popular aftermarket gauges such as DAKOTA DIGITAL, CLASSIC INSTRUMENTS, AUTOMETER, VDO, and others. Rear body harness assembly plugs into the main harness at the left kick panel location and our longer leads allow for stock or custom routing of the wires. Rear body wiring includes backup light lead wires and connectors along with stop and tail light lead wires and connectors. New tail lamp socket and side marker lamp socket pigtail extensions are also included. License plate lamp lead connection, as well as the fuel tank sender lead connection is also included. An optional extra cost dual fuel tank harness is available separately. New floor dimmer switch is provided for ease of installation. Wire length and connection accommodate original floor mount dimmer switch. Engine wiring includes feeds for coil, tach, water temperature, oil pressure, electric choke, and electric speedometer (if needed). A heavy gauge alternator feed and fusible link are also included for any typical high output 1 wire or internally regulated alternator. Connectors supplied for power and tach leads for GM style H. Distributors along with various oil and temp senders. A Ford Gen III series alternator adapter is available separately. Front lighting includes extra long leads that can be routed for stock or optional appearances. All head light, parking light, and directional light leads, along with a switched trigger wire for an electric fan relay (usually recommended with AC) are provided. Mating terminals and connectors are also provided for you to complete your custom installation. New parking lamp socket and side marker lamp socket pigtail extensions are also included. New ignition switch with indexed connector included. New windshield wiper switch with indexed connector and motor leads included which must be mated to your stock motor (mating connector and terminals included). New door jamb switch pigtails and switches are also included. Fits 1973-79 Ford Truck / 1978-79 Bronco. Per California Law (Prop 65) we are required to put the following warning on all our listings. Please verify that the description contains your specific vehicle. While eBays compatibility system does a good job, it sometimes lists sub-models that may or may not be compatible with the part being offered. We have a 70,000 square ware house; so chances are we do have your item in stock and ready to go. Sorry for any inconvenience. This excludes special order items and electrical items. Powered by SixBit’s eCommerce Solution. 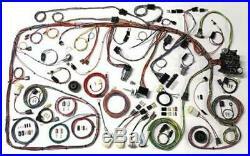 The item “73-79 Ford Truck 78-79 Bronco Classic Update Wiring Harness Complete Kit 510342″ is in sale since Thursday, August 13, 2015. This item is in the category “eBay Motors\Parts & Accessories\Vintage Car & Truck Parts\Other Parts”. The seller is “thepartsplaceinc” and is located in DeKalb, Illinois. This item can be shipped to United States, Canada, United Kingdom, Denmark, Romania, Slovakia, Bulgaria, Czech republic, Finland, Hungary, Latvia, Lithuania, Malta, Estonia, Australia, Greece, Portugal, Cyprus, Slovenia, Japan, Sweden, South Korea, Indonesia, Taiwan, South africa, Thailand, Belgium, France, Hong Kong, Ireland, Netherlands, Poland, Spain, Italy, Germany, Austria, Israel, Mexico, New Zealand, Singapore, Switzerland, Norway, Saudi arabia, Ukraine, United arab emirates, Qatar, Kuwait, Bahrain, Croatia, Malaysia, Brazil, Chile, Colombia, Costa rica, Panama, Trinidad and tobago, Guatemala, Honduras, Jamaica, Bahamas, Viet nam. Tagged: 73-79, 78-79, bronco, classic, complete, ford, harness, truck, update, wiring. Classic Update Wiring Harness Kit. 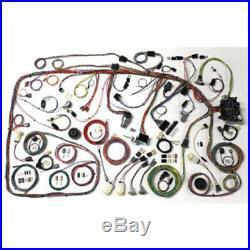 Brand New Reproduction Wiring Harness Kit. The “Classic Update” wiring kits are made for the restoration enthusiast who wants some modern amenities in their classic vehicle. These kits include everything you need to modernize your classic vehicle: Headlight, Dimmer, and Ignition Switches; Boots, Tubes, and Grommets; Relays, and Flashers; Original Connectors, Terminals, and Disconnects. These kits are specifically made for the listed application and are not a universal designed kit! Manufactured by American Auto Wire. These kits are recommended for MODIFIED original vehicles, not OEM restoration projects. A replacement headlight switch with internal 25-amp circuit breaker, adjustable length shaft, and custom knob. Standard turn signal flasher, hazard flasher, and horn relay mounted on harness. Fuse box designed to fit in original location with no mods to the firewall. All required hardware supplied. New ATO fuse panel allows for easy fuse and circuit breaker accessibility. Harness is laid out and formed to allow for nearly all after market accessories such as; gauge packages, wiper systems, heat and air conditioning systems, etc. Many original switch connector bodies – an American Autowire exclusive feature. Steering column connectors can plug directly into most aftermarket steering columns or stock 1973-79 Ford columns using the adapter and terminals included in the kit. Separate under dash courtesy lamp assemblies are also included for use along with your original dome/interior lighting feeds. Instrument Cluster wiring is designed with a cluster harness disconnect system for easy service and assembly. Original terminals that will plug into the original cluster connector (another American Autowire exclusive) are provided for stock cluster connections. The system will also connect into most popular aftermarket gauges such as DAKOTA DIGITAL, CLASSIC INSTRUMENTS, AUTOMETER, VDO, and others. Rear body harness assembly plugs into the main harness at the left kick panel location and our longer leads allow for stock or custom routing of the wires. Rear body wiring includes backup light lead wires and connectors along with stop and tail light lead wires and connectors. New tail lamp socket and side marker lamp socket pigtail extensions are also included. License plate lamp lead connection, as well as the fuel tank sender lead connection is also included. An optional extra cost dual fuel tank harness is available separately. New floor dimmer switch is provided for ease of installation. Wire length and connection accommodate original floor mount dimmer switch. Engine wiring includes feeds for coil, tach, water temperature, oil pressure, electric choke, and electric speedometer (if needed). A heavy gauge alternator feed and fusible link are also included for any typical high output 1 wire or internally regulated alternator. Connectors supplied for power and tach leads for GM style H. Distributors along with various oil and temp senders. A Ford Gen III series alternator adapter is available separately. Front lighting includes extra long leads that can be routed for stock or optional appearances. All head light, parking light, and directional light leads, along with a switched trigger wire for an electric fan relay (usually recommended with AC) are provided. Mating terminals and connectors are also provided for you to complete your custom installation. New parking lamp socket and side marker lamp socket pigtail extensions are also included. New ignition switch with indexed connector included. New windshield wiper switch with indexed connector and motor leads included which must be mated to your stock motor (mating connector and terminals included). New door jamb switch pigtails and switches are also included. Please note: Classic Update Kits do not support Ammeters. Fits the following models. 1973 – 1979 Ford Truck. T o Understand Why we have Pre-Sell Listings. The item “73-79 Ford Truck Classic Update Series Complete Body Interior Wiring Harness Kit” is in sale since Saturday, October 14, 2017. This item is in the category “eBay Motors\Parts & Accessories\Car & Truck Parts\Exterior\Body Kits”. The seller is “tamraz” and is located in Naperville, Illinois. This item can be shipped worldwide. Tagged: 73-79, body, classic, complete, ford, harness, interior, series, truck, update, wiring.